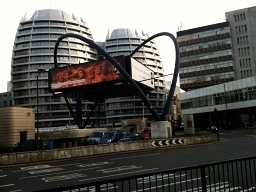 Something interesting is currently happening around the Silicon Roundabout in London. The UK government is planning to help the development of technology-related companies in the area between the Old Street roundabout and the Olympic Village as statistics show this is a sector in constant growth both in terms of market and especially in terms of employment. The initiative has been named “East London Tech City” and since we got the news, we began thinking about how it could affect us or even better, how it could prove to be useful for our plans. A common place where to meet people needed in the development of projects: designers, intellectual-property lawyers, print facilities are better off when only a few meters away. In such a dream environment startups wouldn’t have to spend any time searching on the web for a contact or asking around as they could have who they need at hand, therefore saving huge amounts of time in bringing their projects to life. Could this take the form of a startup-table where all interested parties gather every day for lunch? A way for easily finding customers that can help startups bootstrapping during the early stages. Startups could sell their skills and dedicate part of their time in offering consultancy services in the areas where they are more efficient and knowledgeable. The government could act as a mediator and allow startups to access the program until their third year of life and at the same time it could attract customers into using the services from the startups by offering them discounts on taxes. A stable and well established information reference that keeps startups up to date about events they might be interested in. This point is also aimed at optimizing the time it requires for startups to be aware with what’s happening around them. If these events could be held directly where startups are located, it could help a lot. Efficient communication systems (i.e. no twitter) and nearby venues are the answer. A sustainable setting could be also a plus: young entrepreneurs are more then ever aware of the environmental costs of modern societies and are therefore often better off cycling while commuting to and from the office. This means that secured bicycles racks and better cycling paths could be welcomed. This entry was posted on November 5, 2010 at 11:13 am and is filed under Startup. You can subscribe via RSS 2.0 feed to this post's comments. You can comment below, or link to this permanent URL from your own site.